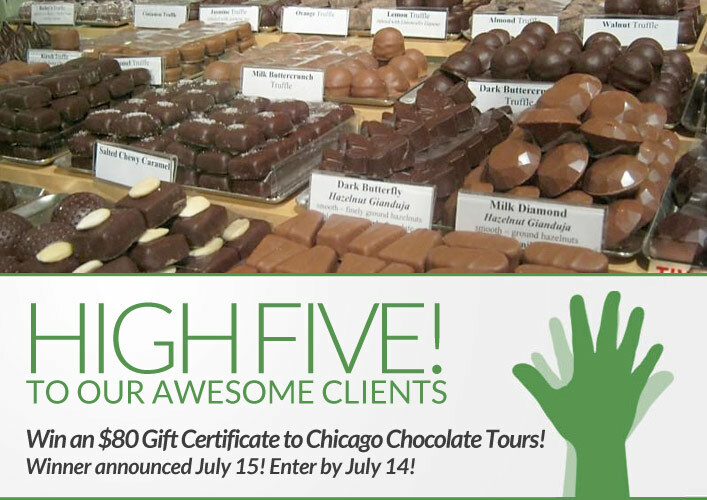 Win an $80 Gift Certificate to Chicago Chocolate Tours! Congratulations to Rose Astorina on winning our thirty ninth High Five Giveaway and thank you to all who entered! Our next giveaway is for an $80 gift certificate (free tour for two!) to Chicago Chocolate Tours. Take a delightfully fun and informative guided walking and tasting tour of select chocolate shops, bakeries, and cafes, from secret treasures to famous favorites. You’ll sample different forms of chocolate, which may range from truffles to cupcakes or other baked goods, to gelato or hot chocolate or even chocolate tea. Savor the flavors on the sweetest tour in town! Uplift through chocolate! Chicago Chocolate Tours is located at 500 N Michigan Avenue, Suite 300. Call them at 312-929-2939, visit their website at chicagochocolatetours.com or on Facebook at facebook.com/chicagochocolatetours. Other than our website, what magazines or blogs do you read for hair and style inspiration? Now, just add a comment to this post with the right answer to be eligible to win! The winner will be announced on Monday, July 15. Entries must be received by midnight on Sunday, July 14. For visuals, I do a general google image search and lately, a pinterest search. For actual reading, I go to naturallycurly.com. I LOVE the frizz forecast!!! Pinterest! Not really a magazine or a true blog but you can always find stuff. I am a regular reader of Cosmo and Elle magazines but also get good tips from Pinterest and YouTube. For bridal hairstyles, I like Bridal Guide. Getting married in October ’14! Hairdresser On Fire is an awesome blog about hair! 🙂 HDOFblog.com Also, Makeup By Camila (or Camila Coelho) also does some fun things with hair. You can find her on youtube. Pinterest is a good place for me to find new ideas. Historical photos of street urchins with questionable attitudes. YouTube has some good suggestions and videos of how to style. is the best inspiration. I do flip thru InStyle mag also. Pinterest and Glamour Magazine. I also follow specific actresses with coloring similar to mind to see how they’re wearing their hair. Allure and Cosmo… I need some more resources! I use Cosmopolitan and Elle magazine, as well as Pinterest and Youtube.